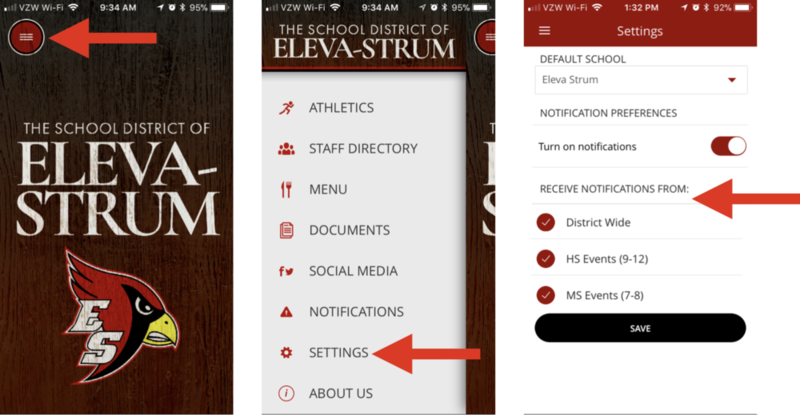 As many of you know our new App for iOS and Android allows you to stay current on all the happenings at Eleva-Strum. One of the features of the App is that it allows us to send you push notifications when we post something to the App and/or Webpage. Sometimes though you may get notifications that don't apply to you. We've implemented some groups that will help narrow down what notifications you get. This won't completely eliminate messages that don't apply to you, but it will reduce them quite a bit. Once you launch the App touch the Menu Button in the upper left. When the menu opens please select Settings. When the settings menu shows up please look under the Receive Notifications From section. There you will see a list of groups to choose from. The list scrolls so if you don't see them all make sure to drag up or down to reveal the rest of the choices. •	District Wide - If you only check one box make sure it is this one. This is were all critical alerts will be posted such as school closures and emergency notifications. •	HS Events - These notifications will be any non-sport related event that involves Students grades 9-12. •	MS Events - These notifications will be any non-sport related event that involves Students grades 7-8. •	Intermediate Events - These notifications will be events that involve students grades 4-6. •	Primary Events - These notifications will be events that involve students grades PK-3. •	HS Athletics - These notifications will be related to any High School sport. •	MS Athletics - These notifications will be related to any Middle School sport. You may return to this menu at any time to adjust your choices if you are receiving notifications that you don't want or if you are not getting ones that you do want.